The Javits Center is more than just a convention center. Named after the legendary and lifelong New Yorker, Senator Jacob K. Javits, this self-sustaining New York icon has become a wildlife sanctuary, a community partner and a nationwide nexus where the latest ideas in business and pop culture converge under one very green roof. With a significant investment in our infrastructure, we have quickly become a leader in sustainability, security and technology, setting a new standard for convention centers throughout the country. We employ thousands of experienced event and construction professionals dedicated to coordinating and constructing events with major brands from around the world, generating waves of economic activity across the region. And with a historic expansion project underway, we‘re preparing to host an even wider variety of events in the years to come, attracting new generations of visitors to Manhattan’s West Side. The Javits Center’s namesake, Jacob Koeppel Javits, served New York for more than 30 years as New York State Attorney General, a U.S. Congressman and U.S. Senator. The son of a janitor, Senator Javits was born on May 18, 1904, and raised in a tenement on the Lower East Side of Manhattan. In 1920, he graduated from George Washington High School as president of his class, attended night school at Columbia University, and continued to New York University Law School where he earned his Juris Doctor degree. Throughout his years of public service, he demonstrated a deep commitment to social issues, by helping create the National Endowment for the Arts and by sponsoring the 1973 War Powers Act. 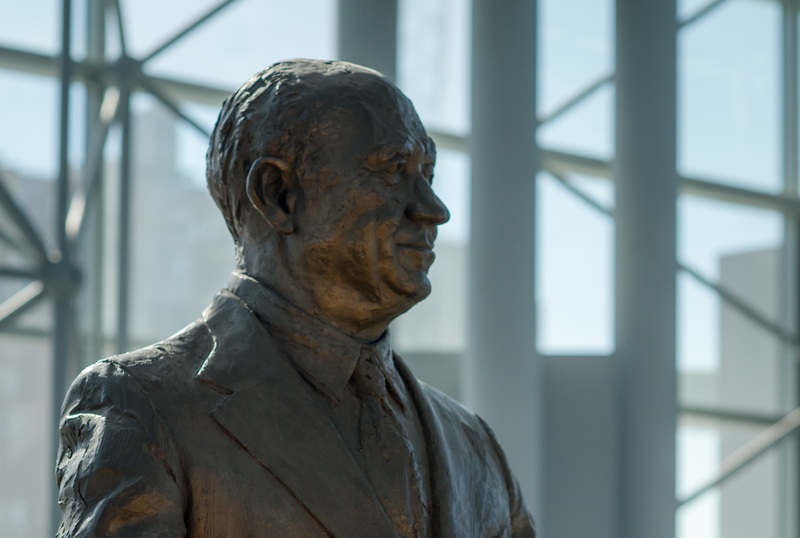 The Javits Center is proud to continue Senator Javits’ legacy of public service by hosting events that support New York’s economy, creating jobs and business opportunities for New Yorkers. For more information about Senator Javits, please visit the Senator Jacob K. Javits Collection at Stony Brook University. The mission of the New York Convention Center Operating Corporation (NYCCOC) is to serve the citizens of the State and City of New York by generating new business and employment opportunities, serving as a catalyst for the continued redevelopment of the local community and operating in the public interest, consistent with the social, economic and environmental priorities of existing state policy. NYCCOC meets these objectives through maximizing the booking of trade shows, conventions, public shows, and special events that stimulate spending within the regional economy, create jobs at the Javits Center and in the surrounding community and generate a reliable source of revenue for the State and City of New York. NYCCOC strives to achieve these results by operating in accordance with the highest professional standards, generating sufficient operating revenue to be financially self-supporting, maintaining the convention center facility in accordance with our core values and ensuring our operations are consistent with contemporary sustainability objectives and a community friendly approach. Accountability We are accountable for meeting the needs and expectations of everyone we serve. Attitude We demonstrate a positive attitude and encourage positive results. Consistency We provide a quality experience through consistent processes and practices that are solution oriented. Service We provide exceptional service by proactively engaging with our customers. Empowerment We create effective solutions and desired outcomes for everyone we serve. Knowledgeable We understand the specific needs of our community and our business. Caring We care about the success of our colleagues, our community and our business partners. Communication We communicate in a clear and consistent manner. Innovative We implement innovative solutions. Integrity We require high standards of ethics and conduct for our directors, officers and employees. Sustainability We operate as a model of sustainability. The State of New York, and the City of New York, which benefit from economic activity and job creation generated by the hosting of events, visitor spending and other activities associated with the Javits Center, as well as directly through enhanced tax revenue. The following are the measurements by which NYCCOC’s performance and the achievement of its mission may be estimated or measured annually. Items 1 through 6 come from PwC generated reports. Items 7 through 10 come from NYCCOC reports. Total Economic Impact combines Sales Impact and Income Impact. Does not include Special Events attendance of 146,078. For Fiscal Year ending March 31, 2016. Does not include Special Events. Detailed information on our team, board of directors, board meeting agendas and minutes, and more.